Data analysis is of central importance in the education of scientists. This book offers a compact and readable introduction to techniques relevant to physical science students. The material is thoroughly integrated with the popular and powerful spreadsheet package Excel by Microsoft. Excel features of most relevance to the analysis of experimental data in the physical sciences are dealt with in some detail. Fully worked problems reinforce basic principles. Underlying assumptions and range of applicability of techniques are discussed, though detailed derivations of basic equations are mostly avoided or confined to the appendices. Preface; 1. Introduction to scientific data analysis; 2. Excel and data analysis; 3. Data distributions I; 4. Data distributions II; 5. Measurement, error and uncertainty; 6. Least squares I; 7. Least squares II; 8. Tests of significance; 9. 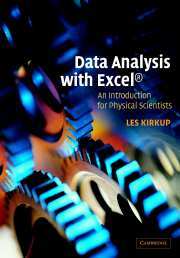 Data analysis tools in Excel and the Analysis ToolPak; Appendices; References; Index.